This year’s fall auction season is just now getting underway, and it is already shaping out to be a record-breaking one. Just last month, a Tudor Submariner sold for $162,000, making it the most expensive vintage Tudor ever sold. Moreover, the word is out on Paul Newman dials, and there are a number of very fine and unique examples up for auction this year, all of which are expected to sell for well above the six-figure price point. The high prices seen in recent years have served as a strong incentive for auction houses to bring their A-game, and this year’s offerings do not disappoint. As seen in previous years, Rolex and Patek Philippe seem to occupy the majority of lots with prodigious pre-sale estimates; however there are a number of excellent timepieces that will be hitting the auction block this season, with several estimated to clear the million-dollar mark. The list of noteworthy Rolex pieces this year is extensive, with numerous Newman dials and pre-Daytona chronographs making an appearance. There is even a “Single Red” Sea-Dweller that will be up for sale later this month; however a slightly less-obvious choice is the possibly unique and previously unknown, reference 6542 GMT-Master in 18k yellow gold with a left-handed crown configuration, which Phillips will be selling as Lot 192 in The Geneva Watch Auction: Eight. Any reference 6542 in 18k gold is extremely rare; however one with a left-handed crown configuration has never once before graced the auction block. 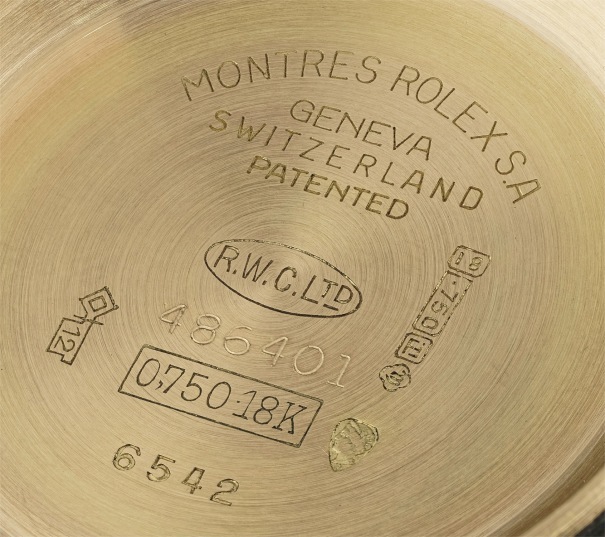 This particular example dates back to 1959, and originally left the Rolex factory with its crown on the left side of its case (reference number and serial number engravings are on their correct sides). It is highly likely that this particular watch was a special order/issue piece, and it very well may be the only example of a left-handed reference 6542 in 18k gold that has ever been manufactured. 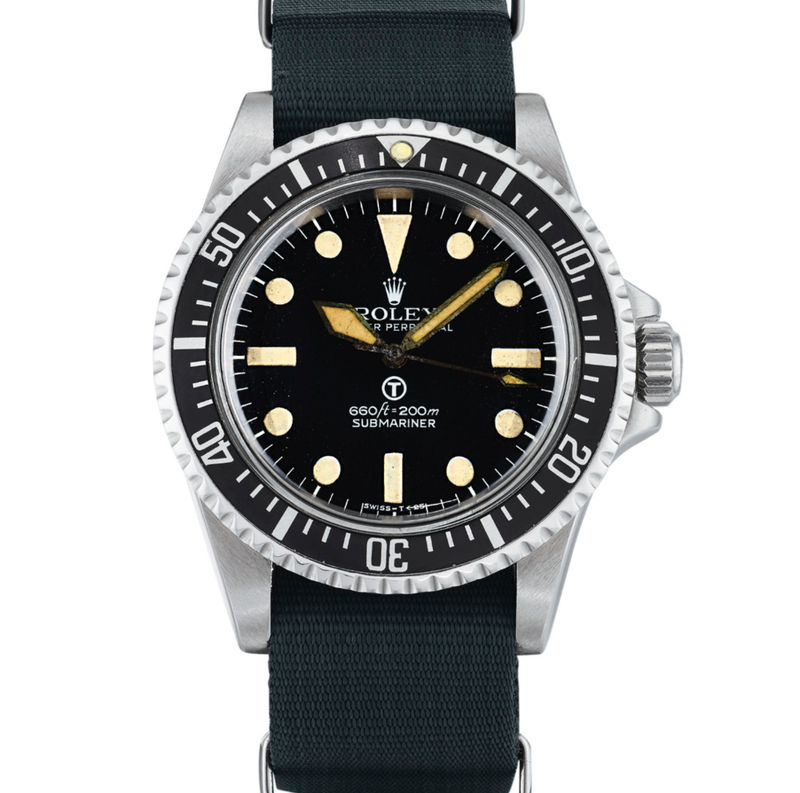 While it was the 1953 release of the Submariner that marked Rolex’s official entry into the dive watch market, the very first watches that Rolex manufactured specifically for SCUBA divers date all the way back to the mid 1930s, and were produced for Panerai to meet an order request from the Royal Italian Navy. 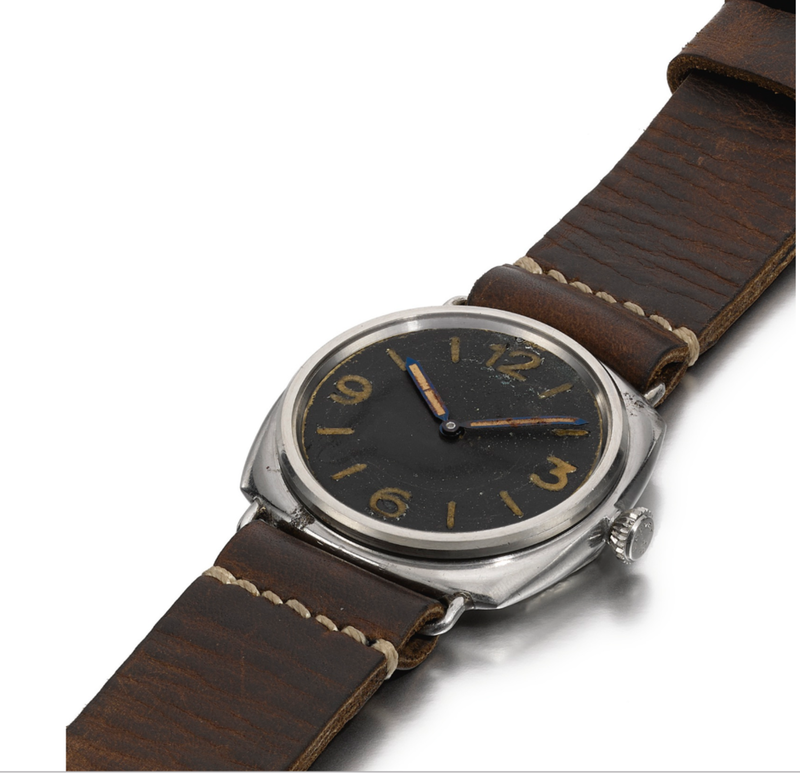 This particular example is representational of a transitional period between type D and type E executions of the watches manufactured by Rolex for Panerai. 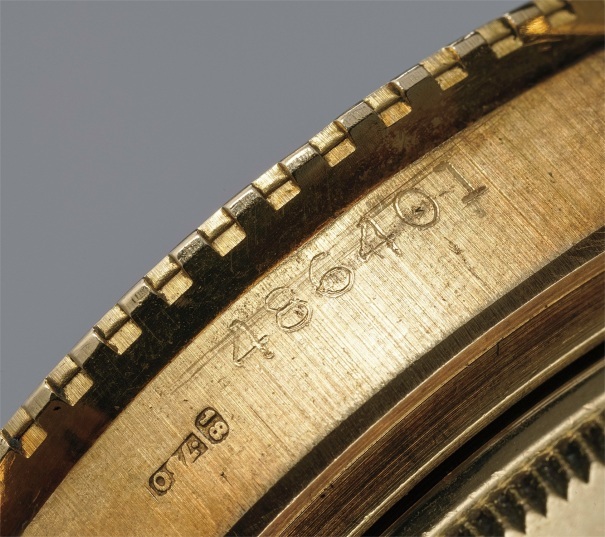 While the case number of this particular example classifies it as a type E execution, it still bears the Rolex markings on its movement and case-back, which is typically indicative of type D executions. 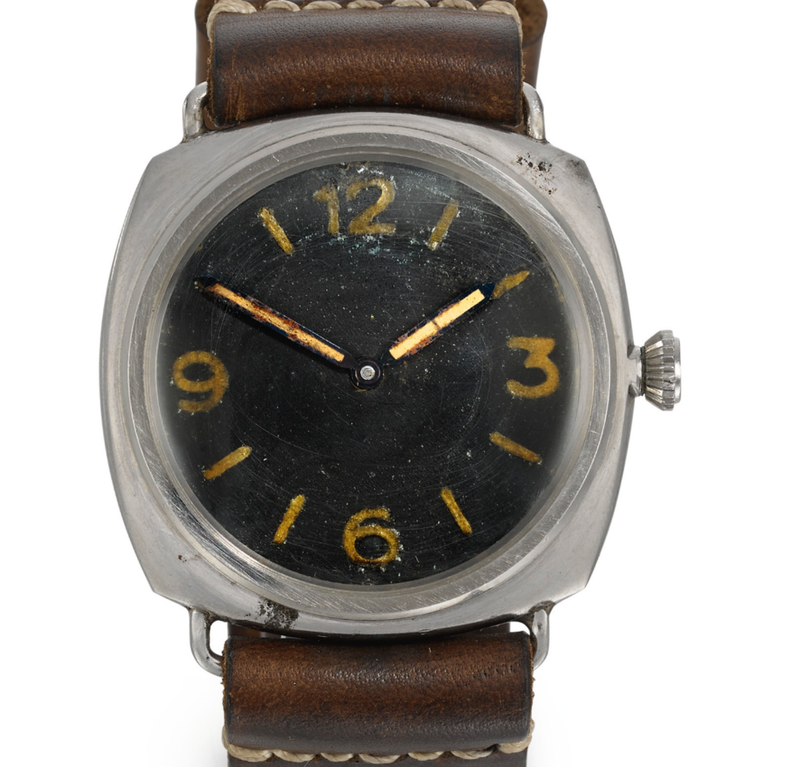 Sotheby’s is selling this historically significant watch (which was previously sold by Bonhams in 2016) as Lot 104 in their upcoming Important Watches sale. This reference 2499/100 is from the fourth and final series of reference 2499 watches, which are widely considered to be among the finest timepieces ever manufactured. Patek Philippe only produced 349 examples of the reference 2499, with less than 100 of these belonging to the fourth series. All reference 2499 watches are unequivocally grail-worthy; however it is the dial on this particular example – specifically its tachymeter scale – that makes it so special, and a true highlight of this year’s fall auction season. Listed as Lot 112 in Christie’s upcoming Rare Watches sale, this reference 2499/100 is one of only four known examples of reference 2499/100 watches with outer tachymeter/telemeter markings on their dials. Additionally, due to a number of other subtle differences between the dial on this particular piece and those found on other 2499 watches, there is a very strong possibility that Patek Philippe manufactured this watch as a one-off piece by special request from its first owner. An obvious Rolex highlight from this fall auction season that does not have a “Newman dial” is the reference 5517 Rolex “MilSub” that was manufactured for the British Armed Forces in 1978. Appearing as Lot 238 in Sotheby’s upcoming Import Watches auction, this particular timepiece is a fantastic and remarkably well-preserved example of a Rolex Submariner that was specifically manufactured to meet strict military specifications. This reference 5517 MilSub checks all the boxes for the serious collector. In addition to having the “circled T” marking on its dial, this watch is fitted with “Sword-style hands, and a bezel insert with individual graduation markings all the way to 60 units. Additionally, all military markings on the case-back are still crisp and clear, and its fixed bars are not bent or misshapen. The Rolex MilSub is considered by many to be the military watch to own, and this particular MilSub is a great example of this legendary and highly sought-after reference. The prototype Omega Speedmaster watches that were part of the “Alaska I” project for NASA are among the most unique and historically important Speedmaster references of all time. Although they never actually made it to the surface of the moon, the original Alaska project prototypes represent Omega’s extensive efforts to create a dedicated “lunar surface chronograph” that could withstand periods of prolonged use in the harsh conditions that exist outside of a spacecraft. This particular watch belongs to the third and final batch of prototypes produced for the “Alaska I” project, and was delivered to NASA for official testing in 1970. Unlike other watches from the “Alaska I” project that used extraordinarily large and roughly finished, cushion-shaped cases, this specific watch uses Omega’s “Mark II style” Speedmaster case, making it more wearable and appropriately proportioned for regular use. Additionally, this watch is accompanied by an official Omega Extract from the Archives, which confirms its “Alaska I” project origins, and subsequent delivery to NASA’s Apollo Program Office. C&T in the news: Cam on Dean Delray's "Let There Be Talk"